Abstract. The goal of this study was to assess the relative importance of the axonal synthesis of phosphatidylcholine for neurite growth using rat sympathetic neurons maintained in compartmented culture dishes. In a double-labeling experiment [~4C]choline was added to compartments that contained only distal axons and [3H]choline was added to compartments that contained cell bodies and proximal axons. The specific radioactivity of labeled choline was equalized in all compartments. The results show that ,050% of phosphatidylcholine in distal axons is locally synthesized by axons. 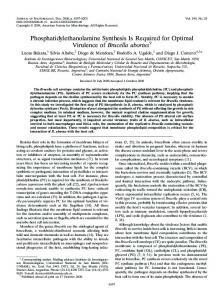 The requirement of axonal phosphatidylcholine synthesis for neurite growth was investigated. The neurons were supplied with medium lacking choline, an essential substrate for phosphatidylcholine synthesis. In the cells grown in choline-deficient medium for 5 d, the incorporation of [3H]palmitate into phosphatidylcholine was reduced by 54 % compared to that in cells cultured in choline-containing medium. When phosphatidylcholine synthesis was reduced in this manner in distal axons alone, growth of distal neurites was inhibited by ,050%. In contrast, when phosphatidylcholine synthesis was inhibited only in the compartment containing cell bodies with proximal axons, growth of distal neurites continued normally. These experiments imply that the synthesis of phosphatidylcholine in cell bodies is neither necessary nor sufficient for growth of distal neurites. Rather, the local synthesis of phosphatidylcholine in distal axons is required for normal growth. Address all correspondence to Dr. Jean E. Vance, Lipid and Lipoprotein Research Group, University of Alberta, Edmonton, Canada T6G 2S2. Tel. : (403) 492-7250. Fax: (403) 492-3383. 1. Abbreviations used in this paper: PtdCho, phosphatidylcholine; PtdEtn, phosphatidylethanolamine; PtdSer, phosphatidylserine. rate of'x,1 mm/day under Teflon-silicone grease barriers into the two side compartments. The center compartment contains proximal axons as well as cell bodies, whereas the left and right compartments contain distal axons alone. Small molecules that are added to the culture medium of one compartment are unable to diffuse into adjacent compartments (Campenot, 1982; Campenot and Draker, 1989). The axonal synthesis of PtdCho was confirmed by experiments in which the specific activities of three enzymes involved in the biosynthesis of PtdCho via the CDP-choline pathway were found to be of similar magnitude in the distal axons and in the cell body-containing compartment and of similar magnitude also to the activities in rat hepatocytes (Vance et al., 1994). Our data did not, however, imply that all of the PtdCho in axons was synthesized in axons. Indeed, in the compartmentalized model for neuron culture, synthesis of PtdCho in the cell body-containing compartment was observed with a concomitant transfer of the PtdCho into distal axons (Vance et al., 1991). These studies support the observations of Pfenninger and Johnson (1983) who examined PtdCho synthesis and anterograde transport in explant cultures of rat sympathetic neurons. These authors concluded, however, that PtdCho synthesis occurred exclusively in cell bodies, although in their study the synthesis of PtdCho in pure axons wasnot examined. Our data raised the possibility that axonal membrane lipids may be synthesized largely in situ in axons rather than solely in cell bodies. Therefore, in the present study we have asked: what fraction of axonal PtdCho is synthesized in axons and how important is the axonal synthesis of PtdCho for neurite extension? We report that local production of PtdCho in axons contributes ~50% of the axonal PtdCho. Moreover, we provide evidence that when PtdCho biosynthesis is inhibited in distal axons, but not in cell bodies and proximal axons, the growth of distal axons is substantially decreased. The data imply that synthesis of PtdCho in axons is required for normal axonal extension. 20 parallel tracks were then formed on the dish surface by scraping the collagen from the dish with a pin rake. A Teflon divider was seated on the surface of the dish with silicone grease. Neurons, plated in the center compartment, settled on the substratum of the collagen tracks, and axons elongated along these tracks crossing under the silicone grease barriers and entering left and right compartments. L15 medium without antibiotics (GIBCO BRL, Gaithersburg, MD), but supplemented with the additives prescribed by Hawrot and Patterson (1979) including bicarbonate and methylcellulose, was used for culture of the neurons. Rat serum (2.5%, provided by the University of Alberta Laboratory Animal Services) and ascorbic acid (1 mg/ml) were supplied only in medium given to the cell body-containing compartments. Culture medium was routinely changed every 3-6 d. Nonneuronal cells were eliminated by exposure of the cultures for the first 6 d to medium containing 10 #M cytosine arabinoside. Initially, all three compartrnents were supplied with mouse 2.5 S nerve growth factor (200 ng/ml) (Cedarlane Laboratories Ltd., Hornby, ON, Canada) to allow cell survival and to permit neurite growth in all compartments. The use of nerve growth factor was discontinued in the center compartment after 6 d, so that subsequent neurite growth was largely confined to distal neurites in the side compartments which contained nerve growth factor (Campenot, 1982). In some experiments, delipidated rat serum, prepared as previously described (Yao and Vance, 1988), was used. Choline-deficient medium consisted of L15 medium containing all the ingredients listed by GIBCO BRL, but with choline omitted. The concentration of choline in the normal, choline-containing medium was 11 /zM. In some experiments, cultures were neuritotomized and regeneration of neurites was examined. Neuritotomy consisted of a mechanical removal of distal neurites from left and right compartments with a jet of sterile distilled water delivered with a syringe through a 22-gauge needle. The water was aspirated, the washing step was repeated twice, then fresh culture medium was added. This procedure reliably removes virtually all visible traces of neurites from the side compartments (Campenot, 1992). In one set of experiments, the cellular material was similarly removed from the center compartment, leaving the distal axons intact. Measurements of neurite growth were made as previously described (Campenot, 1992) using a Nikon Diaphot inverted microscope with phase contrast optics outfitted with a MD2 microscope digitizer (Minnesota Datametrics Corp., Minneapolis, MN) which tracks stage movements to an accuracy of +5 /zm. An online personal computer using custom software (Minnesota Datametrics Corp.) calculated the distance from the edge of the silicone grease to the farthest extending neurite on each track and combined these measurements to obtain means and standard errors. In each culture neurites in 16 tracks were measured in left and right compartments. and Intermediates of PtdCho Synthesis Materials and Methods Materials The radiolabeled chemicals [methyl-all]choline (specific activity 15 Ci/ mmol) [methyl-14C]choline (specific activity 55 mCi/mmol), and [9,10 (3H)palmitate (specific activity 54 Ci/mmol) were purchased from Amersham Canada (Oakville, ON). Thin-layer chromatography plates (silica gel G, 0.25-mm thickness) were obtained from BDH Chemicals (Edmonton, Canada). Standard phospholipids were either isolated from rat liver or were purchased from Avanti Polar Lipids (Birmingham, AL). Choline, phosphocholine, CDP-choline, palmitate, and phosphatidylcholine were purchased from Sigma Chemical Co. (St. Louis, MO). All other reagents were from Sigma or Fisher Scientific (Edmonton, Canada). Neuronal Cultures The general culture procedures for the neurons were as previously reported (Campenot et al., 1991). Briefly, superior cervical ganglia were dissected from 1-d-old Sprague-Dawley rats supplied by the University of Alberta farm. Ganglia were enzymatically and mechanically dissociated and the cells were plated either at a density of 2 ganglia/well in a 24-well plate coated with collagen or in the center compartment of the compartmented dishes (0.5 ganglion/dish). Compartmented culture dishes were constructed essentially as previously described (Campenot, 1992). Collagen was dried onto 35-mm Falcon tissue culture dishes to provide a culture substratum. Neurons, either in 24-well dishes or in compartmented dishes, were incubated with medium containing [methyl-3H]choline or [methyl-t4C]choline. For the double-labeling experiments, unlabeled choline was added to the [methyl-3H]choline-containing medium to give the same choline concentration as in the [methyl-14C]choline medium (i.e., 92/~M). After the desired incubation times, the radiolabeled medium was aspirated and the cells were washed twice with ice-cold phosphate-buffered saline. Cellular material from each compartment or well was collected in methanol:water (1:1, vol/vol). Chloroform was added to give a final ratio of chloroform/ methanol/water of 2:1:1 (vol/vol). The lipids were extracted according to the procedure of Polch et al. (1959) and separated by thin-layer chromatography in the solvent system chloroform/methanol/acetic acid/formic acid/ water (70:30:12:4:2, vol/vol). The band corresponding to authentic PtdCho was scraped from the plates and radioactivity was measured. Incorporation of radiolabeled choline into the water-soluble precursors of PtdCho was measured as follows, in some experiments. The upper aqueous phase from the Folch extraction, which contained choline, phosphocholine and CDPcholine, was evaporated to dryness and the residue was dissolved in methanol/water, 1:1, (vol/vol). The sample was applied to a thin-layer chromatography plate and the components were separated in a solvent system consisting of ammonia/methanol/0.6 % NaCl, 5:50:50 (vol/vol). The bands corresponding to authentic standards of choline, phosphocholine and CDPcholine were scraped from the plate and radioactive incorporation was measured. In the experiments in which lipids were radiolabeled with [3H]palmitate, the cells in 24-weU dishes were incubated with 10/~Ci/ml [3H]palmitate. PtdCho and PtdEtn were isolated by thin-layer chromatography in the solvent system chloroform/methanol/acetic acid/formic acid/water, 70:30:12:4:2 (vol/vol) and radioactive incorporation was measured. Other Methods The phospholipid content of the cells was measured by lipid phosphorus determination (Chalvardijian and Rudnicki, 1970). The protein content of ceils was measured with the BCA protein assay reagent (Pierce Chemical Co., Rockford, IL). Figure 1. 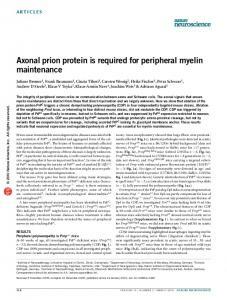 Axons produce '~50% of their own phosphatidylcholine. [Methyl-3H]choline (5 #Ci/ml) (open circles) and [methylJ4C]choline (5 t~Ci/ml) (solid circles) were added to cell body-containing compartments and distal axon-containing compartments, respectively, of isolated rat sympathetic neurons that had been cultured for 11 d. The specific radioactivity of choline was equalized (55/~Ci/nmol) in all compartments by adding unlabeled choline to the cell body-containing compartment to a final concentration of 92/~M. At the indicated times, cellular material of the cell bodycontaining compartment (A), and the distal axon-containing compartrnents (B) was collected and lipids were extracted. PtdCho was isolated by thin-layer chromatography and radioactivity was determined. The experiment was repeated twice with similar results. Figure 2. Incorporation of choline into phosphocholine. From the experiment described in Fig. 1, the water-soluble metabolites of choline were separated by thin-layer chromatography. The spot corresponding to authentic phosphoeholine was scraped and radioactivity was measured. (A) Cell body-containing compartment; (B) distal axon-containing compartments. Incorporation of radioactivity from [3H]choline, open circles, and from p4C]choline, solid circles. Each point is the average of four individual cultures. The experiment was repeated twice with similar results. as incorporation into PtdCho. Our results do not preclude a substantial production of PtdCho in cell bodies but do suggest that at least 50% of PtdCho in distal axons was derived from local synthesis in axons. In contrast to the anterograde movement of [all]label into PtdCho in distal neurites relatively little retrograde movement of [~+C] label from distal axons into proximal axons/ cell bodies occurred. During the first 24 h of the experiment only 15% of PtdCho made from [14C] supplied to distal axons was found in the cell bodies/proximal axons (Fig. 1 A). Consequently, the retrograde movement of [~+C] label from distal neurites makes a relatively small contribution to PtdCho in the cell bodies/proximal axons. Over the time course of the experiment 80-90 % of PtdCho in the center compartment had been made locally from [3H]choline supplied to that compartment (Fig. 1 A). We cannot exclude the possibility that some diffusion of PtdCho in the plane of the membrane occurs. However, the contribution of this process to the transfer of PtdCho between compartments would be expected to be small in light of the considerations of Futerman and coworkers (1993) who calculated that a lipid would take ~ 6 d to move 1 mm along an axon by lateral diffusion. I.gdeen (1985) has also suggested that such diffusion could not provide a mechanism by which phospholipids would be distributed to the distal regions of longer processes. 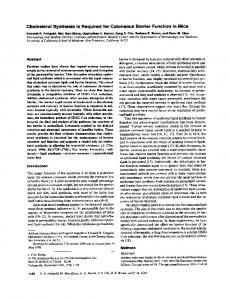 Report "Axonal Synthesis of Phosphatidylcholine is Required ... - BioMedSearch"